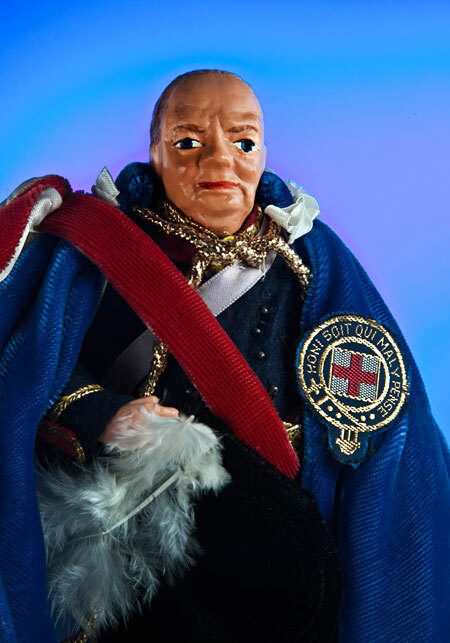 Ceramic doll of Sir Winston Churchill. 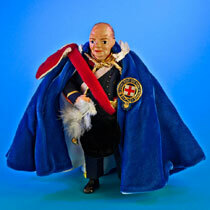 He is wearing a velvet cloak and hat, along with a felt suit with gold trim. He is holding his at, which has a white feather. 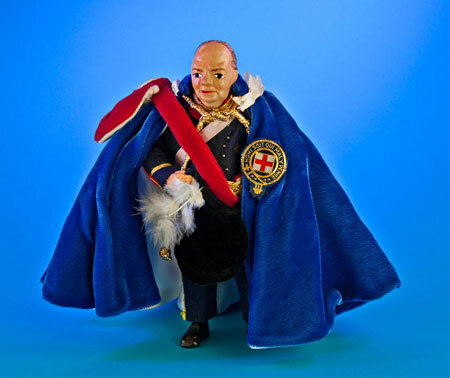 His emblem says “Honi scit qui mal y pense.” which means: “Shamed be he who thinks ill of it.” Tag: “Collectors Costume Dolls by Peggy Nisbet. Made in England. 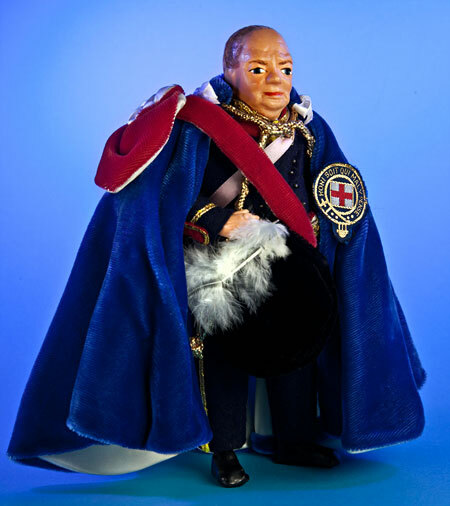 A Peggy Nisbet Model P/615 Sir Winston Churchill In Robes of the Order of the Garter 1874-1965.” For more about the culture and education of Sir Winston Churchill, read the story. 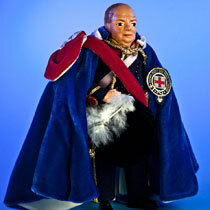 My name is Winston Churchill. I was born in 1874. My parents were Lord and Lady Randolph Churchill. My mother was an American, and my father was an Englishman. I was born in a palace in England , which sounds really neat. However, my parents were so busy that I saw very little of them. As a child, I was quite lonely. 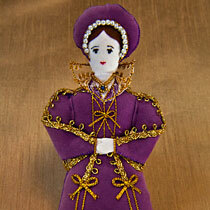 Although I was sent to the best schools, I was not a very good student. It just didn’t seem important to me. I got into a lot of trouble in school. Perhaps I was trying to get my parents’ attention. 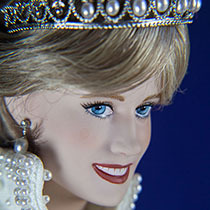 When I was 19 years old, I applied to the British Royal Military Academy. I had a hard time passing the entrance exam (it took three tries). After I entered the academy, I found that I really liked studying about war and strategies. When I graduated, I volunteered for some dangerous missions. Wars were very different way back then. We rode horses. We didn’t have airplanes or tanks. When I was not fighting, I wrote articles about the wars. Writing was fun, and I was good at it. So I left the military and became a war reporter. That way I could make more money. In 1899, I traveled to Africa to write about the Boer War. While there, I was captured by enemy soldiers and put in prison. However, I managed to escape and make my way back to England. That experience gave me even more to write about. I soon became one of the best war correspondents in England. Shortly after that I was elected to serve in Parliament (congress). Many years passed. By 1941, I was 65 years old. Hitler ruled Nazi Germany and built a very strong army. He quickly took control of Poland and Norway. Then he invaded France and other countries in Europe. I was very vocal about the need to fight the Nazis. Many called me a bulldog because I was determined that we should stop Hitler. Finally, the people of England listened, and I was elected Prime Minister. This was World War II. 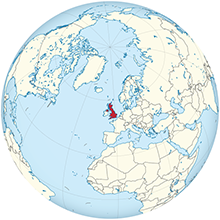 Many people in Britain thought that Germany would soon invade England. After all, how could a small island like England defend itself? We fought for four long, hard years. We fought with tanks, ships and airplanes. A lot of brave men and women died. However, in the end, it was Germany that surrendered. I received many honors after the war. 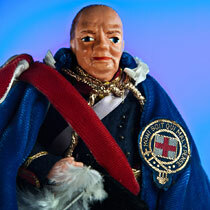 The Queen of England knighted me “Sir” Winston Churchill. I won a Nobel Prize, and I was named “Man of the Year.” These awards were nice, but I am most proud of being called Britain’s bulldog, coach, and leader during World War II.